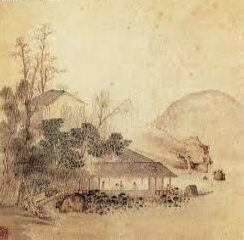 Memory An Old Friend (忆故人, Yi Gu Ren, 古琴) is fairly a recent composition during the early part of the last century. However, the theme it conveys is an ancient one, that of the sadness of missing a friend who was sent away in exile. The piece from the “Shen Qi Mi Pu” 【神竒秘谱】 (1425) collection called “ Shan Zhong Si You Ren”《山中思友人》 (‘Thinking of a friend in the mountains’) .